Imagine a parallel world with its own government, religion, royalty, language, and even animals that exist nowhere else. Sound fun? Apparently a lot of children ages 8 to 12 think so. According to a study recently completed by the University of Oregon’s Imagination Research Lab, 15 to 17 percent of kids create elaborate, incredibly detailed imaginary worlds known as paracosms. These pretend worlds become a very real part of their lives. Marjorie Taylor, professor emerita of psychology and the lead investigator in this study of more than 200 children, says that many of these imaginary worlds are created by small groups of children playing together, often over a long period of time. She is careful to distinguish between the activities she’s talking about and one-time imaginative play in which kids dream something up and then discard the idea as soon as playtime is over. She points to a case study she and colleagues published last year in Creativity Research Journal. The article recounts two paracosms, one created by a group of boys and the other built by a pair of female friends. 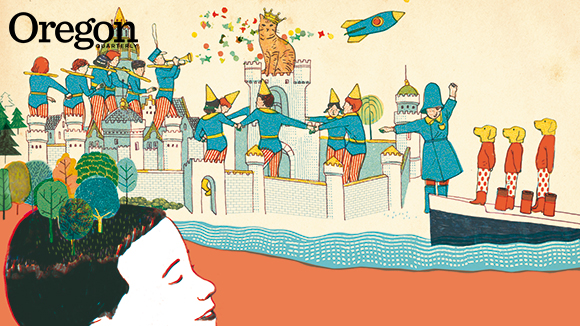 The six-year-old boys made up “independent but coordinated” worlds, each with a real-life pet cat as the imagined king. (The boys chose to create separate worlds when they couldn’t decide whose cat should be king.) The girls imagined a galaxy populated by few humans and many intelligent animals. Each girl invented her own planet where these creatures live, and the planets have shared enemies—bossy girls named Bow-Girl and Cutsie Doodle. In both cases, these imagined worlds were a center point of the children’s play for years. Both girls created art and written narratives about their paracosms, and one of the boys remarked that he thought about his world every day. Taylor believes the creation of paracosms springs from children’s desire to inhabit an alternative to everyday life. It is an impulse that leads kids to private spaces like forts and hideouts that are out of the view of adults. In the case of paracosms, however, the play is driven by imagination, and many children write histories of their imagined worlds or create artifacts like maps or flags. As the examples in the case study suggest, kids often will create individual worlds that are interconnected with those of their friends. Some kids involve their families in their paracosms, and enjoy collaborating with parents on stories about their worlds. Other children are more private about their creations, though they talk about them with friends. The case study mentions that when the children are overheard talking about things that happen in their invented worlds, it sounds as if they are discussing real events. While relatively few children create such detailed worlds and make them part of their lives over a long period of time, many kids have imaginary friends. Taylor has studied this topic extensively for more than 20 years. Her book, Imaginary Friends and the Children Who Create Them (Oxford University Press, 1999) was the first in-depth study of the importance of imaginary friends in child development, and was geared toward the general public, rather than to experts in her field. As recently as 10 years ago, textbooks in developmental psychology did not include even a single entry on imagination. Eventually, Taylor was invited to write entries for some of those books. She subsequently edited a book on the topic, The Development of Imagination (Oxford University Press, 2013). While imaginary friends and paracosms are mostly sources of fun for their creators, researchers believe that the children who participate reap benefits from this particular flavor of play. Taylor says that the kids who engage in imaginative play do better than their peers on creative tasks, such as finishing a story on a prompt provided by a researcher. One of Taylor’s students in the Imagination Research Laboratory, Candice Mottweiler, has completed a longitudinal study of children with imaginary friends. Kids who entered the study at age four are now 14, and there is strong evidence that imaginary friends do a lot more than entertain bored kids. “Our research shows that these children rate well on creative tasks at age four and that they demonstrate strong creative abilities eight years later,” she says. Taylor’s work has been featured in Time magazine, the New York Times, and on such broadcast networks as PBS, NPR, and BBC. These media appearances have helped spread the word that parents don’t necessarily need to be concerned about their kids’ vivid imaginations. “Before our research, people associated imaginary friends with disorders and believed that there must be something wrong with the children who created them,” Taylor recalls. She points to images of disturbed children in movies like The Shining, and notes that many parents worried when their kids created pretend playmates. “Now these companions are understood as a normal, healthy, and potentially beneficial part of development. That’s the most important contribution that I’ve made.”.